Superboy and Robin put an end to some bank robbers, with their trademark banter. After the successful bust, the boys head back to their homes. Jon marks off another crime on his list. He looks at what he must do tomorrow, which is to search for all the pets that have suddenly gone missing. Krypto looks at the list, and after Jon has gone to sleep, he flies to Gotham, to the barn where Bat-Cow is housed. Bat-Cow moos to signal Titus, who comes running. 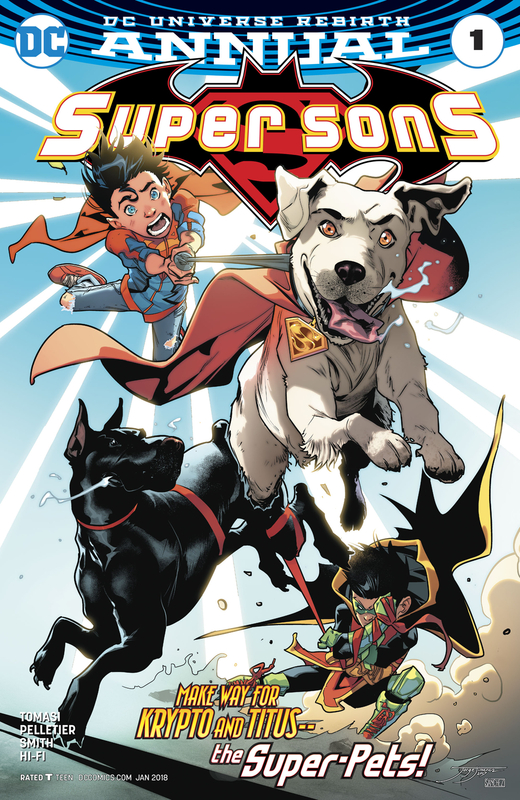 Krypto and Titus fly off to see Detective Chimp. Detective Chimp points them to where their compatriots may be, and they fly off to meet them. Once there, the World's Finest pets explain to the other Super Pets about all the missing animals, and they head out to find them. After some searching, they find the animals aboard an alien ship. The pilot of the ship explains to the Super Pets that he is liberating them, and no longer will the humans hold them as simple pets. After a small battle, Krypto and Titus manage to stop the alien and free all the animals. The next morning, Jon finds himself in Gotham, at his crime fighting partner's home. Damien had called him over, turns out all the missing animals are all hanging around the backyard at Wayne Manor. Story - 5: What a great issue this was, which shouldn't be surprising coming from Tomasi. This is the very reason I love his writing, and he is one of my favorite writers of this era. The guy literally wrote an in-continuity story about the "Super Pets". Never did I imagine that we would get such a silver-age concept in this modern era. Which goes to show that dark, grim and gritty are not always the best choice, even for the Bat-Family. I liked that we didn't need to see the boys very much this issue. The tale being about the pets, and also learning that they have had many other adventures amongst themselves. They're practically the Justice League of the animal kingdom. Speaking of other adventures, one thing that I love about Tomasi's writing, is that he calls back to a lot of his previously written stories. This is something that the great John Ostrander did a lot with the books he wrote. I'm glad to see that Tomasi runs with that writing technique also. No doubt, this alien and this story will come into play in a future issue. How can you not love this book, an excellent read as always. Art - 5: Paul Pelletier is a great artist, I've followed his work since the 90s, back when he was illustrating Kyle Rayner's adventures as Green Lantern. What I love about his work the most is that he can adapt his style to fit the tone and style of the book he is on, here, he has adopted some of Jorge Jimenez's style into his own, mainly the facial features for the boys. It's also not easy to draw a story that features mostly animals, and still convey the narrative. A good part of this issue was practically silent, as the Super Pets conducted their mission. Safe to say that Pelletier has drawing dog facials down well. Being a mostly comedic issue, I liked a lot of the in-jokes, such as Krypto carrying Titus, much like Superman carries Batman. Krypto going to "Bat-Cow" and having her "signal" Titus, and give them the harness for Krypto to fly Titus around in. Detective Chimp was a nice surprise, but then again, an issue full of animals, why wouldn't he be here... I just wish that Beast Boy had made an appearance. Cover Art - 5: Jimenez provides our cover, and as usual, it's fabulous! Love that crazy look on Krypto's face, and Jon behind him.